Can Ebola Spread to DRC Neighbours? WHO's global and African regional leadership saw first-hand the complexities of implementing the Ebola response in North Kivu in the Democratic Republic of the Congo, in visits with the Ministry of Health officials to affected areas over the last two days. While this is the country's 10th Ebola outbreak, it is the first time that the disease has struck a densely populated active conflict zone. 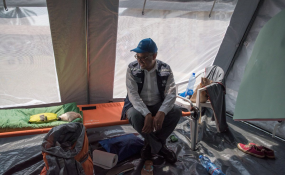 "WHO is calling for free and secure access by all responders to the affected populations," said Dr Tedros Adhanom Ghebreyesus, WHO Director-General. "All of those participating in the response must be able to move freely and safely in conflict areas to do the work that is needed to bring the outbreak under control. The population must also have access to treatment centers that save lives and stop the spread of disease." A little more than a week since the government declared the new Ebola outbreak, Dr Tedros, Dr Matshidiso Moeti, WHO Regional Director for Africa and Dr Peter Salama, WHO Deputy Director-General, Emergency Preparedness and Response went on a two day mission to the city of Beni and to the Mangina health area in North Kivu. Mangina, which is 30 km from Beni, lies at the epicenter of the epidemic and accounts for most of the confirmed cases so far. A range of armed groups are active in the area and this insecurity creates a challenge for health teams needing to go deep into communities to actively find cases and then monitor them twice a day for three weeks. It can also discourage members of the community from coming forward for treatment. "WHO has vast experience with delivering health services in conflict zones in Africa," said Dr Moeti. "We will build on this experience to ensure that our staff and partners can do their work and save the lives of the people we are here to help." Together with the Minister of Health, Dr Oly Ilunga, the WHO delegation observed the launch of the Ebola vaccination for health workers in the Beni reference hospital. They also visited the Emergency Operations Centre in Beni, which was built and provided to partners by the UN mission in the Democratic Republic of the Congo, known as MONUSCO. They met with partners and staff to discuss the challenges ahead, and to take stock of what has already been put in place, including treatment centers run by partners, outreach to communities, a review of infection prevention and control in health centres, and reinforcement to the surveillance system.